Anthrax is one of the oldest infectious disease recorded in history. It is thought that descriptions of plagues in the Bibles book of Exodus may have been outbreaks of anthrax in cattle and humans. Although anthrax spores distributed through the U.S. mail were responsible for several deaths in the fall of 2001, a large aerosol release of anthrax is a more significant threat to the U.S. population. A World Health Organization (WHO) report estimated that 3 days after the release of 50 kg of anthrax spores upwind of a city of 500,000 people, 125,000 infections would occur, producing 95,000 deaths. It has also been estimated that an aerial release of anthrax spores under ideal weather conditions could produce 50% mortality rates as far as 100 miles downwind of the initial release point. A large exposure of the population to anthrax would also have a huge economic impact. For each 100,000 persons exposed, it is estimated that $26.2 billion would be spent. Anthrax is caused by infection with Bacillus anthracis, a gram-positive spore-forming rod. The spore form of anthrax can survive in the environment for many decades. Anthrax spores can be distributed in an aerosol form and are quite resistant to environmental degradation. Anthrax spores from 2 to 6 microns in size are the ideal size for infecting the mucosal surfaces of the lower respiratory tract. Manufacturing and distributing anthrax spores in this size range, while avoiding clumping together of larger spore particles, is one of the challenges facing bioterrorists attempting to use anthrax as a weapon of mass destruction. 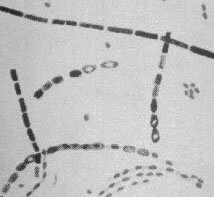 Both bacilli rods and spores are shown in this picture. Human anthrax has three major clinical forms: cutaneous anthrax, inhalation anthrax, and gastrointestinal anthrax. Cutaneous anthrax occurs when the bacillus is introduced through the skin; inhalation anthrax, through the respiratory tract; and gastrointestinal anthrax, by ingestion. Most anthrax cases are cutaneous forms of the disease. In the USA, prior to the 2001 terrorist attack, most individuals contracted cutaneous anthrax by close contact with products derived from infected cattle, sheep, and goats, such as animal hides, hair, wool, bone, and meat. Cutaneous anthrax is easily recognizable, and can be successfully treated with a number of antibiotics. If treated, cutaneous anthrax is rarely fatal. In contrast, the 2001 terrorist attack utilized highly refined anthrax spores. The spores were intentionally produced to maximize their pulmonary dispersion. This is done by reducing the size of the spore particles. The smaller the particles the greater the number and the deeper they can travel into the lungs. Unrecognized or untreated anthrax in all forms can lead to septicemia and death. Patients with gastrointestinal anthrax have a mortality rate between 25% and 75%. As a potential weapon of mass destruction, anthrax would likely be delivered in an aerosolized form, causing inhalation anthrax. Case fatality rates for inhalational anthrax are between 90% and 100%. The gastrointestinal form of anthrax has the highest mortality rate. Symptoms of inhalational anthrax generally occur after an incubation period ranging between 1 and 6 days. After the incubation period, a nonspecific flu like illness occurs, with symptoms of fever, myalgia or muscle aches, headache, a non-productive cough, and mild chest discomfort. Often, a brief intervening period of improvement follows the initial symptoms, followed by rapid deterioration. High fever, difficulty breathing, cyanosis, and shock characterize this next phase. Death is universal in untreated cases and may occur in as many as 100% of treated cases if therapy is started more than 48 hours after symptoms begin. A large number of gram-positive bacilli in nasal swabs or in environmental samples can help confirm a diagnosis of anthrax where intentional release is suspected. Differentiating inhalational anthrax from influenza-like illnesses is a diagnostic challenge, especially during winter months when outbreaks of influenza are common. In the current climate of threat to the U.S., emergency department personnel and primary care physicians should maintain a high index of suspicion for inhalational anthrax. Complicating the diagnosis is the fact that patients initially may not appear very ill. The classic chest X-ray finding of a widened mediastinum or the development of pleural effusions may be subtle or absent on initial medical evaluation. A careful history, with assessment of specific risk factors, such as postal worker, contact with livestock or animal products, laboratory exposure should be obtained from patients with influenza type symptoms. Patients with inhalation anthrax have an initial period of improvement, followed by rapid deterioration. Considerations: Person-to-person cutaneous anthrax is very rare and person-to person pulmonary anthrax has never been reported. Nonetheless, in a mass exposure both contact and droplet precautions should be considered. Contact and droplet precautions may reduce the number of spores to which caregivers are directly exposed. It is estimated that current known strains of B. anthracis require the delivery of at least 8,000 spores to produce pulmonary disease. Due to potentially incomplete decontamination, the number of pulmonary victims and possibility of emergent invasive procedures, it is conceivable that a hospital based caregiver could exceed that spore count while delivering care during a mass exposure. Furthermore, even though medical personnel would likely receive prophylatic vaccine and antibiotics against known strains, weapons grade anthrax which has been bioengineered to resist antibiotics may be available to terrorists. Ciprofloxacin, doxycycline, and other antibiotics including tetracyclines, are used to treat anthrax. Keys to successful management appear to be early institution of antibiotics and aggressive supportive care. Chest tube draining of the recurring pleural effusions, which are typically hemorrhagic, often lead to dramatic clinical improvement. Because these effusions tend to build up again rapidly, maintaing the chest tube may be beneficial. Anthrax vaccine for pre-exposure prophylaxis may be given to those at risk of exposure, such as members of the U.S. military. First responders and medical personnel may be offered the vaccine and/or prophylactic antibiotics. Post-exposure prophylaxis should be used for persons who have been exposed to anthrax spores. The Food and Drug Administration (FDA) has approved ciprofloxacin, doxycycline, and penicillin G procaine for prophylaxis of inhalational anthrax. The optimum length of prophylaxis is uncertain, however, 60 days is recommended, primarily on the basis of animal studies of anthrax deaths. In December 2001, the Department of Health and Human Services (DHHS) announced additional options for prophylaxis against inhalational anthrax for persons who wish to take extra precautions, especially for those whose exposure was high. Three options are now offered: 1) 60 days of antibiotic prophylaxis; 2) 100 days of antibiotic prophylaxis, and 3) 100 days of antibiotic prophylaxis, plus anthrax vaccine. Even though, under normal conditions, Anthrax has little potential for person-to-person transmission, standard precautions must be used when caring for patients with anthrax. Twenty-two confirmed or suspected cases of anthrax occurred during the Fall 2001 attack. The patients are believed to have been infected with anthrax spores distributed through the U.S. mail. The average incubation period from known exposure to symptoms was 4 days. Eleven patients had inhalational anthrax. Fever, chills, drenching sweats, profound fatigue, minimally productive cough, nausea and vomiting, and chest discomfort were symptoms reported by most patients. Six of the 11 patients with inhalational anthrax survived the 2001 attacks, primarily due to early diagnosis and intensive supportive care. Another eleven patients had cutaneous anthrax. Exposure to contaminated mail was the apparent source of infection in all patients with the cutaneous form of the disease. The incubation period ranged from 1 to 10 days. The initial symptom was often a papule or pimple resembling an insect bite that developed into a blister-like elevation on the skin. The blisters then ruptured to form depressed ulcers, often with local edema, ultimately forming dry black scabs known as eschars. Cutaneous anthrax is painless and does not produce a rash.